Reeve for President! The Future is Female! When we first found out we were having a girl, it was in the midst of the heated 2016 election Trump v. Hilary. Not to get too political here (because I can get a little worked up over it!) but I was HEARTBROKEN when Trump won… simply knowing that our daughter was going to be born under a presidency that holds so little value in women’s rights felt….well… just gross. Whatever your political leanings are, I think most logical people can agree that we would prefer if the leader of our country didn’t walk around talking about grabbing women by they pu**y or objectifying women the way he does. 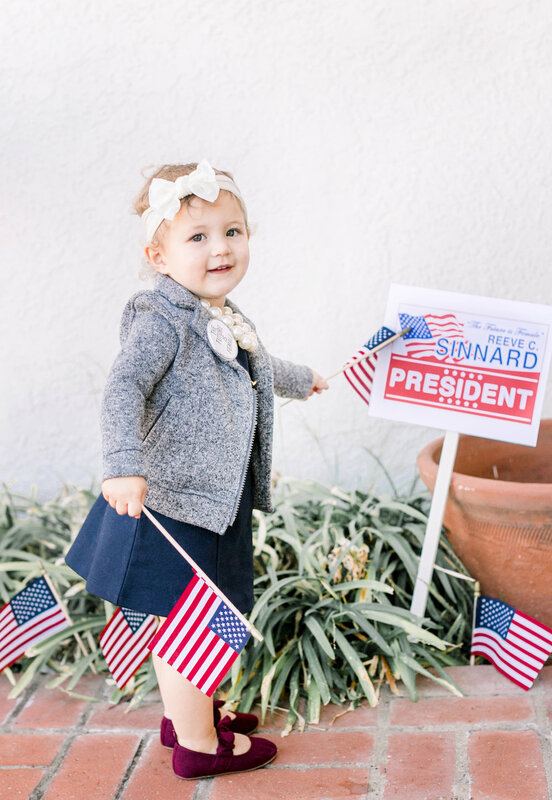 When I decided I want to make Reeve the future POTUS for her Halloween costume and daddy and I would be her Secret Service agents, I really thought it would just be cute and fun for us so I searched Pinterest (as moms do) looking for inspiration. All of the costumes were little boys with a few Hilary Clinton’s thrown in here and there (mostly in a mocking way though) - so at that point I was on a mission! Check out this passionate little Ms. President! Don’t let her overwhelming cuteness distract you from the real issues she’s here to discuss!